This video only takes 47 seconds to watch, but if you follow the tip given, it will make a big difference keeping clutter under control in your home. Hope you enjoy it! Small things can make a big difference! 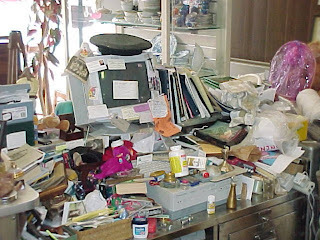 When you use something, put it back right away when you are done and your home won't look like this! Oh my the 2 photo's make me sea-sick! Thankfully my kind of clutter has never been the type that consists of heaps & piles of stuff atop even more stuff...mine has just been the type such as 1 Christmas tree but 4000 ornaments. 3 different size food processors. 10 pairs of black sandals. Anyways, I am a big fan of putting stuff back where it belongs. So much so that I've spent months ensuring that there should be no extra steps to take to put something back. That is, I shouldn't need to move something to get at another. 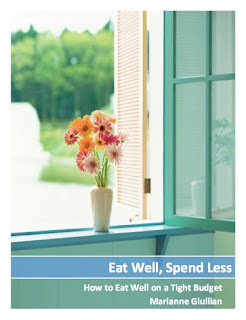 That alone has reduced not only excesses but has been such a time saver & sanity saver! I agree with you completely about being a time saver too. If you rinse out and/or wash dishes right away, you don't have to soak crusty dishes later and scrub a lot! When we put things back right away, we feel more like things are in order in our homes. We all still have some clutter challenges to work on. We just need to figure out a good balance let go of some! Let me know how progress goes with the ornaments, food processors and sandals!